The 9825 was HP's first HPL (High-level Programming Language) computer. It replaced the 9820. 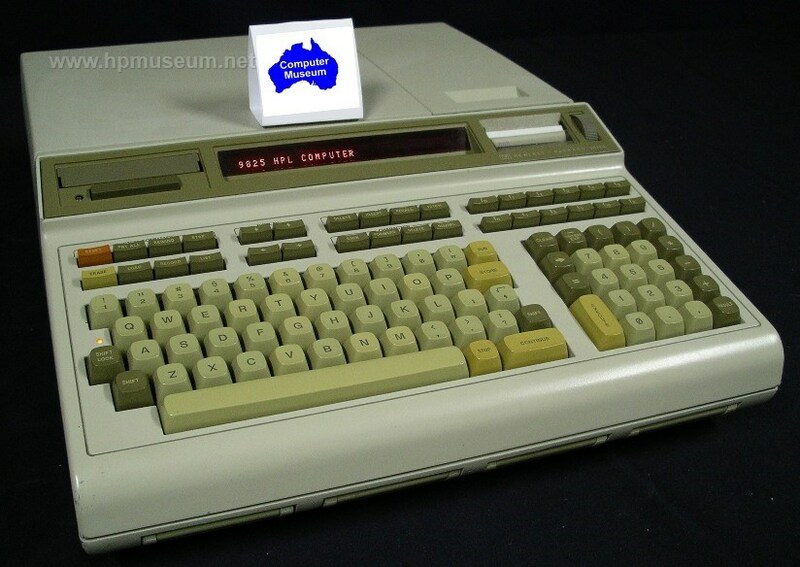 The 9825 had a full QWERTY keyboard and three expansion slots at the rear of the machine. 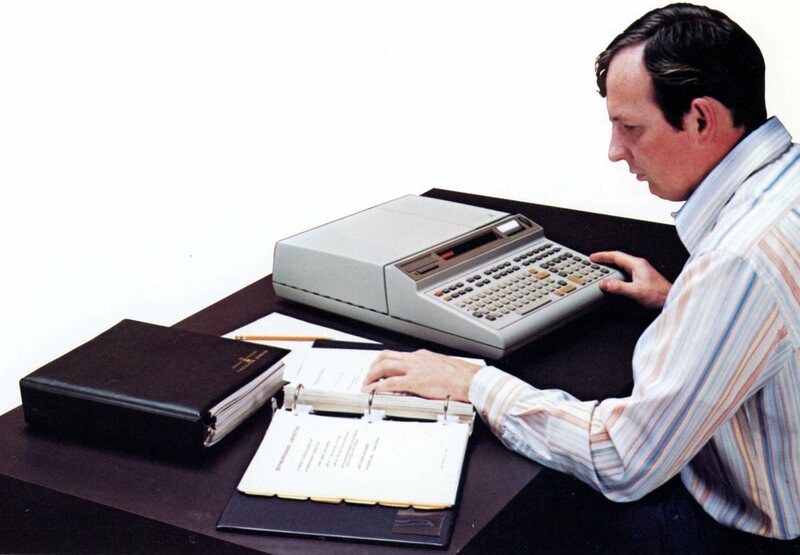 The 9825 also had a live keyboard which enabled the user to type while the computer was executing other functions. Other built-in features included a 16-character thermal printer and a 248K mini-cartridge tape drive. The 9825 could also access external eight inch floppy disc drives (9885 and later the 9895). Additional capabilties could be added via four pluggable ROM slots at the front of the machine or via the tape drive. The 9825A came with 6.8K RAM, expandable to 31.4K. The 9825S was introduced in 1979. It came standard with 23.2K RAM and built-in ROMs. The keys on the original 9825A keyboards protruded only slightly above the key panel surface. In February of 1980, HP changed the keyboard to have standard raised keys and look more "typewriter-like". The 9825B replaced the 9825A in 1980. It came standard with 23K RAM and internally integrated ROMs for Strings, Advanced Programming, Plotters, General I/O and Extended I/O. The 9825T was also introduced in 1980. It came standard with 62K RAM, all of the ROMs of the 9825B, plus a built-in Systems Programming ROM. 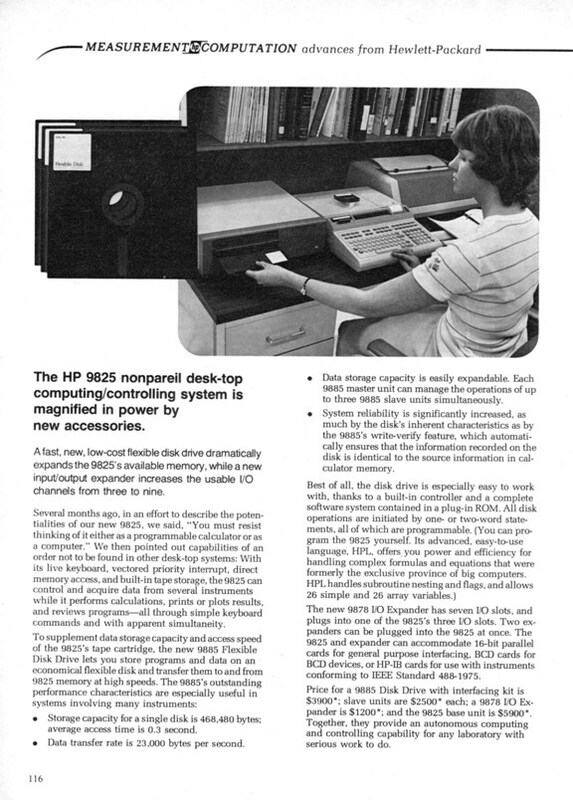 The 9825 was a very successful product for HP. In October of 1980, the company built the 25,000th 9825. 17,000 had been built in Loveland/Fort Collins, and the other 8,000 units had been manufactured in Boeblingen, Germany. The 9825 was obsoleted in May of 1985. Click here for a detailed look at the 9825 and its many innovations. The worldwide expert in these computers is Larry Atherton in Anaheim California. Larry rebuilds 9825s (as well as HP-85 computers) for resale. Norm Pillsbury's story on recovering research data from old 9825 tapes provides an excellent illustration of what Larry can do. For a detailed tutorial on restoring 9825 tape drives and tapes, be sure to visit the hp9845.net site. Here. In May 2017, Paul Berger provided the Museum with ROM images for the 9825A and T. Click here for binary ROM images used with the 9825A and click here for binary ROM images used with the 9825T. Thanks Paul!! Click here to see mspysu79's video on restoring a 9825 power supply. Click here to see mspysu79's video on troubleshooting a 9825. A little over half of the 9825s that we see at the museum will power up and provide a working display. These machines will correctly perform calculations, run programs and address external disc drives and printers. The most common problem of the non-working machines is no display on power up. If you have such a machine, you can confirm that the internal logic of the computer is working by typing "beep" (without the quotation marks) and pressing the EXECUTE key. The machine will beep if it is working. Almost all 9825s are afflicted by non-functioning tape drives. This is usually due to a gooey capstan wheel. Another common problem occurs with the built-in thermal printer. The paper advance mechanism fails on some units, providing output that looks like a series of short horizontal lines. The power supply voltage test points are a little tricky to get to, but this is manageable (see the service manual). Be sure to check your voltages if you suspect any problems that may be power related. If your 9825 occasionally displays strange characters on power up, then it is likely that your system ROM module is defective. This is the large module that plugs in to the right side of the machine. The 9825 was released and shipping and I was in the lab at Loveland thinking about what the 9826 should be when a telegram arrived... you know, a yellow piece of paper with typing on it. It was from a research station in Alice Springs, Australia. It was asking why the fuse in the machine might blow. Did it mean there was an inherent, latent defect in the instrument? Kent Simcoe was our expert on transformers and power supplies and such things. I found that there was a small possibility that a fuse would fail on turn on due to the part of the cycle it was last turned off and and the part of the cycle it was turned on... very, very low chance though. But Kent demonstrated the mechanical stress the fuse saw on every turn on and that some fuses were weak. I passed that information via telegram. Then another telegram came back wanting to know of any way to reduce the chance of the fuse blowing, and it sounded urgent. After some work, I got a telephone number and called him to ask why it was so important. I found out that the research station was sending up a big, high-altitude balloon for basic physics research. The entire experiment was to be controlled by the 9825. It would control the experiment, collect the data, do initial data crunching, and then it handled the transmitter to send the data back. A dead 9825 meant the entire project was wasted. I told him to install a 10 amp fuse with the same body size and that it would be impossible for their system to blow it. At first the project manager there was reluctant to do that. The manual warned against using a larger fuse. Then I explained that blowing the fuse was to prevent a minor defect from causing even more destruction in the machine, or worse yet, to start a fire. I told him if he gets a minor problem that would have blown a fuse that part of the machine might still operate and send some additional data. That once the fuse was blown it was all over anyway. He laughed and said I had just changed his philosophy on all air borne fuses! A few years later I was watching a science documentary on TV and saw that balloon ascending into the heights... can't remember now but it discovered some profound characteristic of our universe. It was a one way trip for the 9825, but it was for humanity to understand our place in the universe.